BOSTON, Mass. 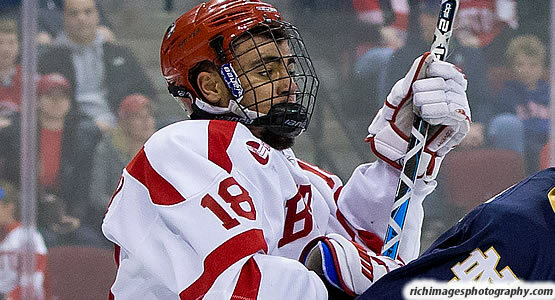 - The Boston University men's ice hockey team closed out the 2017 portion of its schedule with a resounding 9-3 victory over visiting UMass Lowell on Saturday evening at Agganis Arena. Junior Jordan Greenway scored his first career hat trick and added an assist while sophomore Chad Krys added a goal and two assists to help the Terriers move to 8-10-1 on the year and 6-6-1 in Hockey East play. - For the second time in as many nights, freshman Brady Tkachuk opened the scoring with an early goal as the freshman finished off a rush at the 2:45 mark. - Greenway pushed the lead to 2-0 soon after with a shorthanded tally just 12 seconds into the first power play of the night for either team. - BU then cashed in on Lowell's first penalty of the night as sophomore Patrick Harper scored his first of two power-play goals on the night at 14:45 of the first. - Lowell got on the board less than a minute later to create a 3-1 lead for the Terriers entering the first intermission. - After putting three goals on the board in the first, the Terriers did one better in the middle stanza, firing four shots to the back of the net to take a 7-2 lead after two. - Just a couple of minutes after being helped off the ice following a blocked shot on his knee, Krys scored his fourth goal of the season at 8:04 of the second. - Just eight seconds later, Greenway stole the puck off the faceoff before firing home his second goal of the night. - Freshman Cam Crotty pushed the lead to 6-1 at 12:53 of the second with his first goal as a Terrier. - The visitors regrouped an got back on the board to make it 6-2 before Harper once again found the net on a power play to regain a five-goal cushion. - The teams traded goals in the early stages of the third, capped by a tally by freshman Kasper Kotkansalo, before Greenway put the finishing touches on his career night with 4:36 left in regulation. - The nine goals were the most by BU since a 9-5 win over Massachusetts on Jan. 30, 2015, when Evan Rodrigues tied a school record with six assists. - UMass Lowell hadn't allowed nine goals since a 9-2 home loss to Maine on Nov. 11, 2005. - Krys added a game-high five blocked shots and tied for the lead in plus-minus with d-partner John MacLeod at plus-4. - The Terriers put forth a season-high 47 shots, including 24 in the opening period, and finished with a 47-18 shot advantage. - Sophomore Jake Oettinger made 15 saves for the Terriers. - For the River Hawks, Tyler Wall made 27 saves on 33 shots before being replaced by junior Christoffer Jernberg, who stopped 11 of the 14 shots he faced. - BU went 2-for-5 on the power play and killed off four of UMass Lowell's five chances with the man advantage. - Junior Bobo Carpenter earned a pair of assists and Crotty added a helper for his first multi-point game as a Terrier. - The Terriers will take a four-week break for finals and the holidays before returning to action on Friday, Jan. 5, with an exhibition contest against the U.S. National Under-18 Team.